I am crazy about all things light and airy this summer. or more like a weeks worth. The caftan seen in my last post with the DIY Missoni Earrings used this similar pattern, except I color blocked it. The pattern is super easy, if you can sew straight lines, you can sew THIS dress. If you cannot sew straight lines, you can totally find someone that could. It’s easy, on trend, effortless to make, and it’s practically calling YOUR name. Fabric, enough for desired length, if you see the whole collection, the dress comes in a variety of lengths and sheers. Any flowy fabric like a soft rayon, jersey, or chiffon are ideal for this look. Fold Fabric lengthwise so the selvages meet. Cut out neckline. I cut a little extra out in the front neckline (just one side). you may need to alter the fit to desired measurements (less or more depending on your size). 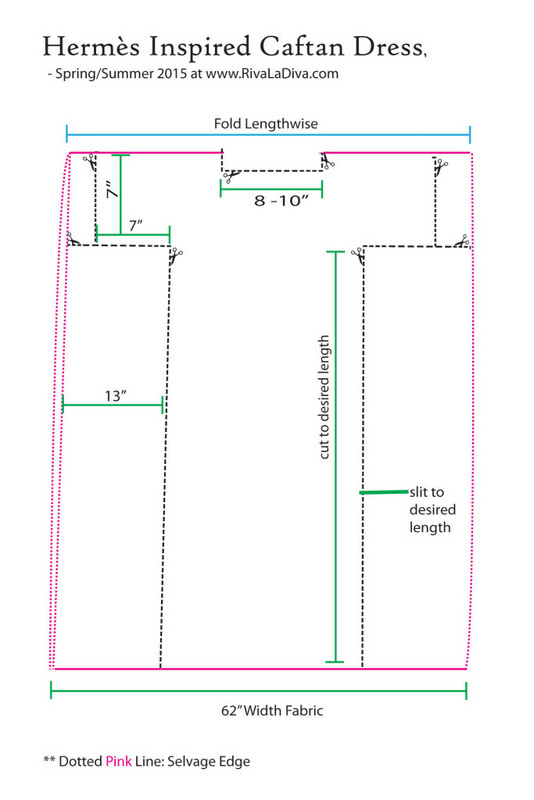 I am a dressmaker’s size “12” which translate to a “2 or 4” at Old Navy. Hem sleeves and hem of dress. Sew sides of the dress starting from sleeve and end around knee length, so you have a flowy slit. I did use a scrap fabric and tied it around my waistline but I love uncinching for an extra flowy look. They are so cool right now and practically the “sweatpants” of dresses because these dresses are so comfy. You could also use very sheer fabric and used it as a beach cover up. So what are you waiting for? Stop reading and go out and make something fun for yourself this summer!! ADORABLE and it looks doable! What type of fabric do you recommend for best results/ease of sewing? OMG Riva! This is stunning! Seriously. I can’t wait to make all these great DIY’s this summer. Keep em coming! Oh my! How easy is this?! And that print — absolutely stunning! Love it! I LOOOOVE this print and totally easy! xoxo Thanks Emily! Great job! It’s gorgeous and looks so expensive! I love the fabric you chose! Adorable! I think I could actually maybe make this. Will you please tell me more about this gorgeous fabric? YES! You can totally make it. The fabric, it’s the best right? I wish one could buy it by the yard but I got it at Michael Levine’s The Loft in downtown LA. The loft has scraps to left over yards of fabric and sells the remnants by the pound. Hope all is well. Welcome by sometimes. >3 Ada. Wow! How talented you are! I am speechless when I read that you made it! It is a such great color, pattern and style! And you styled it so perfectly! love everything about this! You make me want to get another sewing machine and try this out!!! So cute and love that it’s looks like it is so easy. haha! You are so nice and this would be a super easy project to try! xoxo Thanks for the comment and amazing link up! Love it Riva! Especially the colors! Adorable and so chic! This looks like something I could totally do! I love the fabric you choose! Thanks for linking up with Thursday Fashion Files! Yes, yes, yes. I love the colours and the pattern on this dress, definitley getting me in the mood for summer! You look great. I never did learn to sew. Bummer. Thanks for linking up at Who’s Wearing What Wednesdays at Pastries, Pumps and Pi! I looove caftans, they are so eazy breezy glam! The floral print on yours is fab and contrasts nicely with the graphic print of your clutch. Have a gd wkend! I made a couple of simple maxi dresses a couple of years ago, similar but no sleeve shaping at all, I think I will try taking just a bit from the sides to make a bit of a sleeve as you have here, I love the way this hangs. You fabric is SO lovely though, I’ve been reading in the comments above about where you got it, I’ll have to keep my eyes open for something similar and just makeover my existing dress for now! I’ll take pics and post the over at Irish Attic. Could you give. Little more detail.. What type of machine did you use? How did you finish the seams? What kind of needle ?? All of those are great questions and depend entirely on the fabric you use and the finishing you want on your garment. I know, I know…I am not really the grammar police. But YOUR DONE, should be YOU’RE DONE. It is just so distracting and I always think it makes whoever wrote the mistake less credible because of poor grammar. However, on a happier note, love the tutorial and will be giving this a try. Thank you so much for sharing. Luckily, it’s a mistake I don’t make often; additionally, it happens to be one of my grammar-related pet peeves, so thanks for pointing that out. So embarrassed! AWESOME question, Shannon. I did not mention in step 2 how much “extra” I took out the front, I thought this would be a great way for readers to customize their own neckline. Beautiful dress. Would look stunning on anyone. I noticed you didn’t mention how you finished the neckline. Did you use some of the remnant and finish it ? How did you finish the neck? Did you just roll and stitch it or do a bias tape finish? Is viscorse, good for this type of caftan. Riva, I love this, but how did you finish the neckline on the caftan? You didn’t just leave raw edges, did you? Hi! I want t make a white linen one, cuffed sleeves below elbow length…so would I just cut the sleeves about 10” and adjust before hemming? What about finishing the neckline? Thelma and I would like to know. Sounds like a winner! <3 back atcha. Thank you. I really like the look of this dress!! how much fabric do we need yards or metres? I know that the width is 62 inches but you never give the the yardage or meters. Thank you for replying to my question if I wanted the length that you are wearing in the picture what is the yardage or meters?